For the novel by C.S. Lewis, see The Lion, the Witch and the Wardrobe. For other uses, see The Lion, the Witch and the Wardrobe (disambiguation). The Chronicles of Narnia: The Lion, the Witch and the Wardrobe is a 2005 British-American high fantasy film directed by Andrew Adamson and based on The Lion, the Witch and the Wardrobe, the first published and second chronological novel in C. S. Lewis's children's epic fantasy series, The Chronicles of Narnia. It was co-produced by Walden Media and Walt Disney Pictures and distributed by Buena Vista Pictures. William Moseley, Anna Popplewell, Skandar Keynes and Georgie Henley play Peter, Susan, Edmund, and Lucy, four British children evacuated during the Blitz to the countryside, who find a wardrobe that leads to the fantasy world of Narnia. There they ally with the Lion Aslan (voiced by Liam Neeson) against the forces of Jadis, the White Witch (Tilda Swinton). 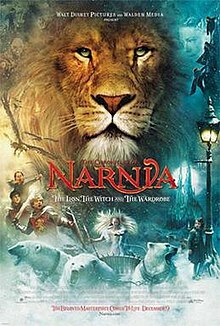 The Lion, the Witch and the Wardrobe was the first of three adaptations of C. S. Lewis' series thus far released, and was followed by Prince Caspian in 2008 and The Voyage of the Dawn Treader in 2010. The three films have grossed over $1.5 billion worldwide among them. During World War II, the Pevensie children, Peter, Susan, Edmund and Lucy, are evacuated from a London suburb to Professor Digory Kirke's country home. Mrs Macready, the strict housekeeper, explains he is unaccustomed to hosting children. While the Pevensies play hide-and-seek, Lucy discovers a wardrobe and enters the fantasy world called Narnia. Seeing a lamppost, Lucy encounters the faun Mr. Tumnus, who invites her to his home. He puts Lucy to sleep by playing a lullaby on his flute. When Lucy wakes up, she finds Tumnus grieving. He explains that Jadis, the White Witch, has cursed Narnia to a hundred years of winter. If a human is encountered, they are to be brought to her. Tumnus cannot bring himself to kidnap Lucy, so he sends her home. When she returns to Professor Kirke's house, hardly any time has passed, and her siblings disbelieve her story. One night, Edmund follows Lucy into the wardrobe, entering Narnia. While searching for Lucy, he meets the White Witch, who claims to be queen. She offers him tea and Turkish Delight and the prospect of becoming king if he brings his siblings to her castle. After she departs, Edmund and Lucy meet again and return. Lucy tells Peter and Susan what happened, but Edmund lies. Professor Kirke suggests she is telling the truth, though they remain unconvinced. While running away from Mrs. Macready after accidentally breaking a window, the four siblings retreat to the wardrobe and enter Narnia. They discover the Witch has taken Mr. Tumnus, and they meet Mr. and Mrs. Beaver, who tell them about Aslan. According to the beavers, Aslan intends to take control of Narnia from the Witch. The four must help Aslan; it has been prophesied that if two sons of Adam and two daughters of Eve sit in the four thrones, the White Witch's reign will end. Edmund sneaks off to visit the Witch. When he arrives at her castle, she is furious he has not delivered his siblings. The Witch sends wolves to track down the children and the beavers, who barely escape. Edmund is chained in the Witch's dungeon, where he meets Tumnus. The Witch demands Edmund reveal his siblings' location. After Tumnus claims that Edmund knows nothing, The Witch tells Mr. Tumnus Edmund betrayed him, then turns Tumnus to stone. While Peter, Lucy, Susan, and the beavers travel, they hide from what they believe to be the White Witch. It is really Father Christmas, a sign that the Witch's reign is ending. Father Christmas gives them weapons to defend themselves. Lucy receives a healing cordial that can heal any injury. Susan receives a magical horn that will summon help and a bow and quiver full of arrows. Peter receives a sword and a shield. After evading wolves led by Maugrim, the group reaches Aslan's camp. Aslan is revealed as a huge and noble lion, who promises to help Edmund. Later, two wolves ambush Lucy and Susan. When Peter intervenes, Maugrim attacks him, and Peter kills him. Some of Aslan's troops follow the other wolf to the witch's camp and rescue Edmund. Peter is knighted by Aslan. The White Witch journeys to Aslan's camp and claims Edmund, but Aslan secretly offers to sacrifice himself instead. That night, as Lucy and Susan covertly watch, the White Witch fatally stabs Aslan. In the morning, he is resurrected, citing magic beyond the Witch's understanding. Aslan takes Susan and Lucy to the Witch's castle, where he frees the prisoners she turned to stone. Edmund persuades Peter to lead Aslan's army. While saving Peter from the Witch by destroying her wand, Edmund is mortally wounded. As the Witch fights Peter, Aslan arrives with reinforcements and kills her. After Edmund is revived by Lucy's cordial, the Pevensies are crowned King Peter the Magnificent, Queen Susan the Gentle, King Edmund the Just, and Queen Lucy the Valiant. Fifteen years later, the Pevensie children, now young adults, chase a white stag through the forest. They encounter the lamppost Lucy saw earlier and suddenly tumble out of the wardrobe at the same time and day they left, becoming children again. Lucy later attempts to return to Narnia via the wardrobe. Professor Kirke tells her he has tried for many years, and they will probably return to Narnia when they least expect it. William Moseley as Peter Pevensie, the eldest of the four Pevensie children. Noah Huntley as Adult Peter Pevensie, who has grown up as a king in Narnia. Anna Popplewell as Susan Pevensie, the second eldest child of the four Pevensie children. Sophie Winkleman as Adult Susan Pevensie, who has grown up as a queen in Narnia. Skandar Keynes as Edmund Pevensie, the third of the four Pevensie children. Mark Wells as Adult Edmund Pevensie, who has grown up as a king in Narnia. Georgie Henley as Lucy Pevensie, the youngest of the four Pevensie children. Rachael Henley as Adult Lucy Pevensie, who has grown up as a queen in Narnia. Liam Neeson as the voice of Aslan, the great lion who was responsible for creating Narnia. Tilda Swinton as The White Witch, who holds Narnia under an eternal winter without Christmas or Spring or Summer. James McAvoy as Mr. Tumnus, a faun who at first works for the White Witch, but befriends Lucy Pevensie and joins Aslan's forces. Ray Winstone as the voice of Mr. Beaver, a beaver who helps lead the children to Aslan. Dawn French as the voice of Mrs. Beaver, a beaver who helps lead the children to Aslan. Kiran Shah as Ginarrbrik, the White Witch's servant dwarf. Jim Broadbent as Professor Digory Kirke, an old professor. He lets the children stay at his country estate during the war. Elizabeth Hawthorne as Mrs. Macready, Kirke's strict housekeeper. James Cosmo as Father Christmas. He gives Peter, Susan, and Lucy their Christmas gifts. Michael Madsen as the voice of Maugrim, a wolf who is captain of the White Witch's secret police. Patrick Kake as Oreius, a centaur who is second-in-command of Aslan's army. Shane Rangi as General Otmin, a minotaur who is second-in-command of the White Witch's army. Morris Cupton as Train Guard, the guard of the train Peter, Susan, Edmund and Lucy ride. Judy McIntosh as Helen Pevensie, the mother of the four Pevensie children. Rupert Everett as the voice of Mr. Fox, a fox who helps the children along their way to Aslan. Producer Philip Steuer voices Phillip, Edmund's talking horse. The radio-announcer that Peter listens to on the rainy day near the beginning of the film is played by Douglas Gresham, co-producer of the movie and C. S. Lewis's stepson. Keynes' voice broke during filming, so some of his voice track had to be re-looped by his sister Soumaya. Mr. Pevensie is only glimpsed in a photo which Edmund tries to retrieve during the bombing, which is of Sim-Evan Jones' father. With the exception of Tilda Swinton, who was the first choice to play Jadis, the White Witch, casting was a long process. Beginning in 2002, Adamson went through 2500 audition tapes, met 1800 children and workshopped 400 before coming down to the final four actors for the Pevensies. Moseley and Popplewell came from the very start of casting, whilst Henley and Keynes were cast relatively late. Moseley was cast because casting director Pippa Hall remembered she cast him as an extra in Cider with Rosie (1998). He beat 3000 boys to the role of Peter and quit school to learn all his lines. Aslan's voice was a contention point. Brian Cox was originally cast in the role on December 9, 2004, but Adamson changed his mind. Liam Neeson sought out the role, and was announced as the voice on July 17, 2005. During the early 1990s, producers Frank Marshall and Kathleen Kennedy were planning a film version. They could not find a space in Britain to shoot the film during 1996, and their plans to set the film in modern times made Douglas Gresham oppose the film, in addition to his feeling that technology had yet to catch up. Perry Moore began negotiations with the C. S. Lewis Estate in 2000. On December 7, 2001, Walden Media announced that they had acquired the rights to The Chronicles of Narnia. The success of Harry Potter and the Philosopher's Stone prompted the producers to feel they could make a faithful adaptation of the novel set in Britain. "Harry Potter came along, and all those cultural or geographical lines were broken," Mark Johnson explained. "When The Lion, The Witch and the Wardrobe was being developed at Paramount, the imperative was to set it in the U.S., and it just doesn't hold. [...] It's not the book." Guillermo del Toro turned down the offer to direct due to his commitment on Pan's Labyrinth. Following an Academy Award win for Shrek, director Andrew Adamson began adapting the source material with a 20-page treatment based on his memories of the book. As such the film begins with the Luftwaffe bombing and concludes with an enormous battle, although they do not take up as much time in the novel. In the novel, the battle is not seen until Aslan, Susan, Lucy and their reinforcements arrive. This was changed in the movie because Adamson said he could vividly remember a huge battle, an example of how Lewis left a lot to the readers' imagination. Other small changes include the reason all four children come to Narnia, in that an accident breaks a window and forces them to hide. Tumnus also never meets Edmund until the end in the novel. Minor details were added to the Pevensies, such as their mother's name, Helen, being the actual first name of Georgie Henley's mother. Finchley as the home of the Pevensies was inspired by Anna Popplewell, who actually is from Finchley. Adamson also changed the circumstances in which Lucy first comes into Narnia. He felt it was more natural that she first see the wardrobe while looking for a hide-and-seek hiding place, rather than just chance upon it exploring the house. The film also hints at Professor Kirke's role in The Magician's Nephew, such as the engravings on the wardrobe, when it is a simple one in the novel, and the Professor's surprise and intrigue when Peter and Susan mention Lucy's discovery in the wardrobe. When Lewis wrote the novel, it was the first of the series and the back-story later outlined by the subsequent books in the series did not exist. Additionally in the novel, the father of the Pevensie children is in London with their mother, but in the film, their father is fighting in the war as Lucy states to Mr. Tumnus when they first meet in Narnia. Weta Workshop head Richard Taylor cited Hieronymus Bosch's The Garden of Earthly Delights as an inspiration on the film. He felt Narnia had to be less dark and gritty than their depiction of Middle-earth in The Lord of the Rings because it is a new world. Many of Weta's creature designs were designed for digital creation, so when Howard Berger and KNB FX inherited the practical effects work, they had to spend three months retooling approved designs for animatronics. Berger's children would comment and advise upon his designs; they suggested the White Witch's hair be changed from black to blonde, which Berger concurred with as he realized Swinton's wig looked too Gothic. Principal photography began in New Zealand on June 28, 2004, shooting in primarily chronological order. Adamson did this in order to naturally create a sense of mature development from his young actors, which mirrored their real life development. Georgie Henley and Skandar Keynes were never shown the set before filming scenes of their characters entering Narnia, nor had Henley seen James McAvoy in his Mr. Tumnus costume before shooting their scenes together. The first scene shot was at the former RNZAF Base Hobsonville for the railway scene. Afterwards, they shot the Blitz scene, which Adamson called their first formal day of shooting. The filmmakers asked permission to bring in twelve reindeer to New Zealand to pull the White Witch's sled. The Ministry of Agriculture and Forestry denied, citing the potentially deadly Q fever from which the North American reindeer population suffers as the reason. However, ten wolves and wolf hybrids were allowed in for filming in Auckland. To replace the denied live reindeer Mark Rappaport's Creature Effects, Inc. created four animatronic reindeer that were used in shots where the deer were standing in place. The reindeer were designed with replaceable skins to get the most usage; brown for Father Christmas's and white for those of the White Witch. The cast and crew spent their time in New Zealand in Auckland before moving in November to the South Island. Shooting locations in the South Island included Flock Hill in Canterbury, the area known as Elephant Rocks near Duntroon in North Otago, which was transformed into Aslan's camp. The castle scene was filmed in Purakaunui Bay, in The Catlins district, not far from the most southern point in New Zealand. They filmed in the Czech Republic (Prague and National Park České Švýcarsko), Slovenia and Poland after the Christmas break, before wrapping in February. The soundtrack was composed by Harry Gregson-Williams. Gregson-Williams had previously worked with Adamson on Shrek (2001) and Shrek 2 (2004). In addition there are three original songs in the film; Can't Take It In by Imogen Heap, Wunderkind by Alanis Morissette and Winter Light by Tim Finn. Evanescence lead singer Amy Lee also wrote a song for the film, but it was not included in the soundtrack. The soundtrack was recorded at Abbey Road Studios, London, England, and in Los Angeles, CA. Gregson-Williams employed the 75-piece Hollywood Studio Symphony Orchestra, along with a 140-member choir (mostly members of The Bach Choir) and numerous other solo musicians such as electric violinist Hugh Marsh and vocalist Lisbeth Scott (at his Wavecrest Studio). He composed the original score and then spent late September through early November 2005 conducting the Hollywood Orchestra and overseeing the recording of the English choir. For "colour", he employed instruments used in ancient folk music, and to underscore critical dramatic moments, he added choral textures and, occasionally, a solo voice. The score includes instances of electronic music. The soundtrack received two Golden Globe Award nominations: "Best Original Score" and "Best Original Song" (for "Wunderkind"). EMI also released a compilation soundtrack entitled Music Inspired by The Chronicles of Narnia: The Lion, the Witch and the Wardrobe was released on September 2005. The album features songs by Contemporary Christian music artists, such as Bethany Dillon, Kutless, and Nichole Nordeman. It released Waiting for the World To Fall by Jars of Clay as a single. The album went on to win the Special Event Album of the Year at the GMA Music Awards. On December 7, 2005, the film premiered in London, going on general release the following day. The film was released December 8, 2005, in the United Kingdom and December 9, 2005, in North America and the rest of Europe. Worldwide, Narnia earned $745,013,115 marking it the 55th highest-grossing film of all-time worldwide. It had a worldwide opening of $107.1 million, marking Disney's fifth largest opening worldwide (at the time it was the largest). It is the third-largest movie worldwide among those released in 2005 and it currently still remains the highest-grossing movie of the Narnia franchise worldwide, and separately in North America and overseas. Finally, it is also the most successful film of Walden Media worldwide. The film opened with $23,006,856 in 3,616 theatres on its opening day (Friday, December 9, 2005), averaging $6,363 per location. The film took in a total of $65,556,312 on its opening weekend (December 9–11, 2005), the 24th best opening weekend at the time (now 54th). It was also Disney's third largest opening weekend at the time (now the 34th largest) as well as the second biggest December opening, behind The Lord of the Rings: The Return of the King. It is now fourth following the 2012 opening of The Hobbit: An Unexpected Journey, the 2007 release of I Am Legend, and the 2009 release of Avatar as well. Additionally, it made the third largest opening weekend of 2005. It grossed $291,710,957 in total becoming the second highest-grossing film of 2005 behind Star Wars: Episode III – Revenge of the Sith. It surpassed the gross of Harry Potter and the Goblet of Fire by only $1.7 million, although the latter grossed $895.9 million worldwide, ahead of The Lion, the Witch, and the Wardrobe. It is the highest-grossing film of the 2005 holiday period, the second highest grossing Christian film, the 6th largest family – children's book adaptation, the 9th highest-grossing fantasy – live action film and the 10th highest-grossing film overall in Disney company history. Finally, it is the largest film of Walden Media worldwide. Box Office Mojo estimates that the film sold over 45 million tickets in North America. On Rotten Tomatoes, the film has an approval rating of 76% based on 213 reviews, with an average rating of 6.9/10. The site's critical consensus reads, "With first-rate special effects and compelling storytelling, this adaptation stays faithful to its source material and will please moviegoers of all ages." On Metacritic the film holds an average weighted score of 75 out of 100, based on 39 critics, indicating "generally favorable reviews". CinemaScore reported that audiences gave the film a rare "A+" grade. Critic Roger Ebert also gave the film 3 out of 4 stars. Ebert and Roeper gave the movie "Two Thumbs Up". Movie critic Leonard Maltin gave the film 3 out of four stars, calling it, "an impressive and worthwhile family film," though he also said, "it does go on a bit and the special effects are extremely variable." Duane Dudak of the Milwaukee Journal Sentinel gave the movie 3 out of 4 stars. Stuart Klawans of The Nation said, "All ticket buyers will get their money's worth." Elizabeth Weitzman of New York Daily News gave it 4 out of 4 stars and said: "A generation-spanning journey that feels both comfortingly familiar and excitingly original." Critic Mick LaSalle of the San Francisco Chronicle listed it as the second best film of the year. Kit Bowen gave the film 3 out of 4 stars. However, John Anderson from Newsday, reacted negatively to the film, stating, "…there's a deliberateness, a fastidiousness and a lack of daring and vision that marks the entire operation." The Lion, the Witch and the Wardrobe won several awards including the Academy Award for Best Makeup; the BeliefNet Film Award for Best Spiritual film; the Movieguide Faith & Values Awards: Most Inspiring Movie of 2005 and Best Family Movie of 2005; and the CAMIE (Character and Morality In Entertainment) Award. Others include the British Academy Film Awards for Makeup and Hair and Orange Rising Star (James McAvoy); Outstanding Motion Picture, Animated or Mixed Media; the Phoenix Film Critics Society Award for Best Performance by a Youth in a Lead or Supporting Role (Georgie Henley, Female); the Costume Designers Guild Award for Excellence in Fantasy Film (Isis Mussenden); and the Saturn Award for Costumes (Isis Mussenden) and Make-up (Howard Berger, Greg Nicotero, and Nikki Gooley). Georgie Henley, in her performance as Lucy Pevensie earned critical acclaim for her performance. She won several awards, including the Phoenix Film Critics Society award for Best Actress in a Leading Role and Best Performance by a Youth. She also won other awards either for Best Young Performance or Best Actress in a Leading Role. The DVD for The Chronicles of Narnia: The Lion, The Witch, and The Wardrobe was released on April 4, 2006. It is available in a standard one-disc set (with separate fullscreen and widescreen editions), and a deluxe widescreen two-disc boxed set with additional artwork and other materials from Disney and Walden Media. The DVD sold four million copies on its first day of release and overtook Harry Potter and the Goblet of Fire to become the top selling DVD in North America for 2006. As of December 2008 it has grossed $353.5 million in DVD sales, equivalent to 12,458,637 units sold. The film was also released on VHS the same day, making it the final Walden Media film released on the format. Disney later issued a four-disc extended cut of the film on DVD. It was released on December 12, 2006, and was available commercially until January 31, 2007, after which Disney put the DVD on moratorium. The extended cut of the film runs approximately 150 minutes. The set includes all of the features previously released on the two-disc special edition. The two additional discs include a segment called "The Dreamer of Narnia", a previously unreleased feature-length film about C. S. Lewis, and additional production featurettes. Most of the extended footage, besides the extended battle sequence, is longer establishing shots of Narnia and footage of the Pevensies walking in Narnia. The high-definition Blu-ray Disc version was released on May 13, 2008, in the United States, and on June 16, 2008, in the United Kingdom. ^ a b "The Chronicles of Narnia: The Lion, the Witch and the Wardrobe". American Film Institute. Retrieved November 14, 2016. ^ a b "The Chronicles of Narnia: The Lion, the Witch and the Wardrobe (2005)". Box Office Mojo. Retrieved February 5, 2009. ^ "Narnia dvd sales". the-numbers.com. December 20, 2008. ^ a b c d Andrew Adamson, William Moseley, Anna Popplewell, Skandar Keynes, Georgie Henley (2006). The Chronicles of Narnia:The Lion, the Witch and the Wardrobe Cast Commentary (DVD). ^ a b c Richard Taylor, Howard Berger, Isis Mussendun, Roger Ford, Donald McAlpine, Sim-Evan Jones, Harry Gregson-Williams, Mark Johnson (2006). Cinematic Storytellers (DVD). Buena Vista. ^ a b Chronicles of a Director (DVD). Buena Vista. 2006. ^ a b c Visualizing The Lion, the Witch and the Wardrobe: The Complete Production Experience (DVD). Buena Vista. 2006. ^ a b c d Andrew Adamson, Mark Johnson, Roger Ford (2006). Commentary (DVD). Buena Vista. ^ Roya Nikkhah (July 3, 2008). "William Moseley on Prince Caspian". The Daily Telegraph. Retrieved July 4, 2008. ^ "Brian Cox Cast as the Voice of Aslan". NarniaWeb. December 9, 2004. Retrieved January 13, 2007. ^ Wloszczyna, Susan (May 2, 2005). "The wonderful world of 'Narnia' SIDEBAR: 'Narnia' nearly ready". USA Today. Retrieved January 13, 2007. ^ "Liam Neeson Will Voice Aslan". NarniaWeb. July 15, 2005. Retrieved January 13, 2007. ^ Soren Anderson (July 16, 1995). "Wholesome fare film proves Hollywood's moral 'cupboard' isn't bare". The News Tribune. ^ Marilyn Beck; Stacy Jenel Smith (October 18, 1996). "Soundstage space crunch alters filmmaker Marshall's plans". Los Angeles Daily News. ^ a b Potts, Kimberly. "20 Secrets about Narnia (Page 2)". Movies.com. Archived from the original on December 15, 2006. Retrieved January 13, 2007. ^ a b Fisher, Paul (November 21, 2005). "Interview: Andrew Adamson "Chronicles of Narnia – Lion, Witch & Wardrobe"". Dark Horizons. Archived from the original on November 25, 2005. Retrieved January 7, 2007. ^ a b Faraci, Devin (August 11, 2005). "The Coverage of Narnia – Part 1". CHUD. Archived from the original on February 3, 2007. Retrieved January 7, 2007. ^ Davidson, Paul (December 7, 2001). "Move Over, Harry – A Real Fantasy Classic Is Coming to Town". IGN. Archived from the original on October 17, 2007. Retrieved January 7, 2007. ^ Sam Adams (December 10, 2007). "Fantasy films? There's truth in there too". Los Angeles Times. Retrieved December 10, 2007. ^ "Del Toro crafts a harrowing fairy tale". Star Beacon. December 29, 2006. Archived from the original on September 11, 2012. Retrieved March 28, 2007. ^ Simon Thompson (July 6, 2006). "Popplewell Gives Narnia Sequel Update". Comingsoon.net. Retrieved February 24, 2007. ^ Joanna Cohen (December 2, 2008). "Richard Taylor on the Weta Workshop and Prince Caspian". Rotten Tomatoes. Archived from the original on December 3, 2008. Retrieved December 2, 2008. ^ George Rousch (December 2, 2008). "Prince Caspian DVD Interview: Creature Effects Wizard Howard Berger". Latino Review. Retrieved December 2, 2008. ^ Mike Szymanski (December 3, 2008). "More Caspian Clips, Creatures". SCI FI Wire. Archived from the original on December 16, 2008. Retrieved December 3, 2008. ^ Perry Moore; Anna Popplewell; Georgie Henley; Andrew Adamson; Roger Ford; Ben Wooten; Richard Taylor; Howard Berger; Dean Wright; Douglas Gresham (2005). The Chronicles of Narnia: The Lion, the Witch and the Wardrobe – The Official Illustrated Movie Companion. Harpercollins. pp. 104–113. ISBN 0-00-720817-0. ^ "Narnia Filming Underway!". NarniaWeb. June 28, 2004. Retrieved January 7, 2007. ^ Alan, Perrott (August 26, 2004). "Animatronic reindeer replace living variety in Narnia film". New Zealand Herald. Retrieved November 22, 2006. ^ "Filming at Elephant Rocks". Te Ara: The Encyclopedia of New Zealand. Retrieved March 4, 2014. ^ The Children's Magical Journey (DVD). Buena Vista. 2006. ^ "Narnia Shooting Ends". IGN. February 16, 2005. Archived from the original on October 17, 2007. Retrieved January 6, 2007. ^ Mouth, Blabber (November 26, 2004). "BLABBERMOUTH.NET – Film Producers: EVANESCENCE-Penned Score Is Figment Of AMY LEE'S Imagination". roadrunnerrecords.com/blabbermouth.net. Archived from the original on June 6, 2011. ^ a b Brennan, Mike. "Exclusive - The Chronicles of Narnia - First Listen". SoundtrackNet. November 14, 2005. ^ Burlingame, Jon. "Harry Gregson-Williams: A 21st Century Man". Music World via BMI. October 5, 2006. ^ "WORLDWIDE OPENINGS". Box Office Mojo. Retrieved April 25, 2011. ^ "2005 WORLDWIDE GROSSES". Box Office Mojo. Retrieved April 25, 2011. ^ "'Narnia' Vs. 'Narnia'". Box Office Mojo. Retrieved April 25, 2011. ^ "Walden Media". Box Office Mojo. Retrieved April 25, 2011. ^ "The Chronicles of Narnia: The Lion, the Witch and the Wardrobe". Box Office Mojo. Retrieved April 25, 2011. ^ "OPENING WEEKENDS". Box Office Mojo. Retrieved April 25, 2011. ^ "TOP OPENING WEEKENDS BY MONTH". Box Office Mojo. Retrieved April 21, 2013. ^ "2005 OPENING GROSSES". Box Office Mojo. Retrieved April 25, 2011. ^ "2005 DOMESTIC GROSSES". Box Office Mojo. Retrieved April 25, 2011. ^ "Holiday 2005: 'Kong' vs. 'Narnia' vs. 'Goblet'". Box Office Mojo. Retrieved April 25, 2011. ^ "Christian". Box Office Mojo. Retrieved April 25, 2011. ^ "Family – Children's Book Adaptation". Box Office Mojo. Retrieved April 25, 2011. ^ "Fantasy – Live Action". Box Office Mojo. Retrieved April 25, 2011. ^ "BUENA VISTA". Box Office Mojo. Retrieved April 25, 2011. ^ "The Chronicles of Narnia: The Lion, the Witch and the Wardrobe (2005)". Box Office Mojo. Retrieved July 13, 2016. ^ "The Lion, the Witch and the Wardrobe reviews". Retrieved October 5, 2014. ^ Stuart Klawans. Imitation of Art. ^ "Metacritic: 2005 Film Critic Top Ten Lists". ^ Kit Bowen (December 9, 2005). "Hollywood.com review". Hollywood.com. Retrieved October 5, 2014. ^ "Newsday – Long Island's & NYC's News Source". ^ "The Chronicles of Narnia: The Lion, the Witch and the Wardrobe". IMDb. Retrieved October 5, 2014. ^ "Narnia DVD Sales Dominate First Week – ComingSoon.net". April 13, 2006. ^ "The Chronicles of Narnia is the Top Selling DVD for 2006". MovieWeb.com. May 17, 2006. Archived from the original on April 17, 2007. Retrieved October 24, 2006. ^ "Narnia total dvd numbers". the-numbers.com. December 20, 2008. ^ "The Chronicles of Narnia: The Lion, the Witch and the Wardrobe – DVD Sales". the-numbers.com. ^ McCutcheon, David (September 29, 2006). "Disney Closes the Vault: Four films locked away by Disney after December". IGN. Retrieved January 3, 2007. ^ "DVD Press Release". Retrieved October 5, 2014. ^ "Disney Sets 'Chronicles of Narnia' Blu-ray for May". High-Def Digest.